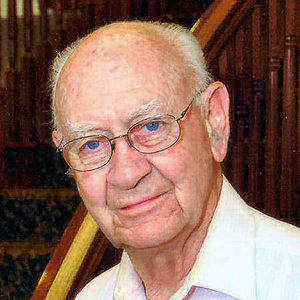 John Reinbold, 81, formerly Wahpeton, ND, passed away Wednesday, January 9, 2013 at Pioneer Cottages, Fergus Falls, MN. The Funeral Mass will be Monday January 14, 2012 at 1:30 PM at St. John's Catholic Church, Wahpeton. Visitation will be Sunday, from 4 PM to 6 PM with a 5 PM Prayer Vigil at Willow Creek Chapel, Wahpeton, and one hour before the service at the church on Monday. Interment will be at Fairview Memorial Gardens, Wahpeton. Vertin-Munson Funeral Home, Wahpeton, is in charge of arrangements. John Anthony Reinbold was born on August 26, 1931 to hungarian immigrants, Simon and Elizabeth (Kaip) Reinbold at Glen Ullin, ND. He attended local school and graduated from Hebron High School in 1948. He then attended college at the University of North Dakota, Grand Forks receiving a Masters Degree in English. On August 31, 1953 John entered the U.S. Army at Fort Lee, VA. He was honorably discharged on August 30, 1956. He married Mary Colleen "Coney" Cook on December 29, 1954 at St. Michael's Catholic Church, Grand Forks, ND. The couple lived in Colorado Springs, CO and Richmond, VA while John was in the service. In 1958 the couple moved to Warren, MN where John worked in the school district from 1958-1969. He then began his 21 year employment with the North Dakota State College of Science from 1969-1990. The couple raised their family in Wahpeton. "Coney" died on November 11, 2009 and John continued to reside at the Twin Town Villa, Breckenridge, MN until entering the Pioneer Cottages, Fergus Falls, MN in February of 2012. John was a member of St. John's Catholic Church, Kiwanis, Elks, Woody Keeble VFW Post No. 4324, DAV, Hafner-Miller-Ross American Legion Post No. 20 and the Minnesota Education Association. He wrote a history book "100 Year History of NDSCS" and wrote several articles in the Life Options Generations in Fargo, ND. He enjoyed running, writing and photography. The couple built a lake home on West McDonald Lake, MN and enjoyed living there in the summer with family. He is survived by his children; Joel (Cathleen) Reinbold, Freeport, Ill, Beth (Mike) Stewart, Hudson, CO, Jeffrey Reinbold, Bismarck, ND and Brenda (Dave) Clevenger, Loveland, CO, 6 grandchildren; Phillip, Daniel, Cameron, Bailey, Ryan and Molly, his 3 sisters; Lena Schafer, Dickinson, ND, Agnes (Clarence) Kitzan, Bowman, ND and Irene (Delbert) Riedlinger, Glendive, MT and 2 brothers; Joseph (Donna) Reinbold, Hebron, ND and Roger (LaVerne) Reinbold, Bismarck, ND and a sister-in-law, Rose Reinbold, Bismarck, ND. He was preceded in death by his parents, his wife "Coney" and 3 brothers; Simon Jr., Marvin and Leo. Memorials preferred to St. John's Catholic Church or the North Dakota State College of Science. Mr. Reinbold was the best teacher ever, I will always remember him with deep respect and love. God bless Mr. Reinbold and his wonderful family. I shall never forget Mr. Reinbold. One of the best teachers I ever had. I borrowed some his techniques ("put away everything but a pencil") with my own students. My condolances. Our deepest sympathy to the entire John Reinbold family. John was a great man and we enjoyed hearing from him from time to time at the Hebron Herald. Reinbold Family, My thoughts and prayers are with you. I first got to know John as my English Instructor at NDSCS. He was a stickler for details...which helped me out a lot; when I graduated from Science and then went up to NDSU. Later on I was hired at NDSCS to teach Political Science and got to know John as a fellow faculty member. He was a great teacher. I had him in junior high, he loved to teach!! He also knew how to get our attention....does anyone remember the yard stick slamming down on the desk? Always got me back from my daydreaming!! LOL My condolences to his family. Mr. Reinbold taught English/literature to the Dental Hygiene class of 1976. He created in me a love to learn new words and expand my vocabulary. At my first job, one of the dentists had an incredible vocabulary. As he talked to patients, I would jot down the words and get my dictionary out when I returned home. I still save the Word Power page from Reader's Digest.